FDM:How do you describe the concept of nested-based manufacturing (NBM)? Bob Alsup, Cabinet Vision: The general procedure is to place a full sheet of melamine, plywood, MDF or other panel material on a machine, typically a CNC router, and cut parts for an entire cabinet or other product out of that sheet. It's an alternative to using a panel saw and point-to-point. Kelley Downey, apps: Using a nesting software package, parts are automatically nested on the panel for the best yield. The machine cuts the parts, routs, drills holes, and creates necessary dadoes, cutouts or whatever is needed. So when the parts come off the router, all the machining work is done except for edgebanding and horizontal drilling. Todd Herzog, Accu-Router: There are a few different levels of nesting capability. The lowest level is manual nesting using a digitizing system. Next is manual nesting using CAM software. And a full-blown nesting software package becomes a system capability. There are two ways to nest. You can nest based on parts to make as many of the same type as possible. Or you can nest different sized parts together. The advantage to doing the latter is you can get better yield and you don't have to handle it in inventory. When the parts come off the machine, it's in a kit form and can be send directly to assembly. Ken Susnjara, Thermwood: Thermwood's perspective of nested-based manufacturing is broader than most. We're emphasizing "furniture fabrication." Instead of running batches of parts through machines in a factory, you create a computerized cell and build the entire product there - ma chin ing, assembly, sanding - so it comes out of the cell ready to be finished. Essentially, we're trying to make a system where an average worker can walk up to the cell and actually make furniture without having a lot of specialized skills. FDM:What are the advantages to nesting? Tim Worms, Komo: Although each nest can be different, the method allows for JIT production because there's no setup time involved, no changing of fixtures or tooling. It's all done automatically on the router through the software. There's also labor savings. You need only one operator at one machine, versus two operators - one running a panel saw and the other a point-to-point. Dennis Stephen, Stiles: Parts for a given cabinet will be machined together and will flow through the shop to assembly in a single group. This avoids confusion and the need to sort through piles of panels to find parts for a given cabinet. Bar code labels on parts can be eliminated. Note: If parts from more than one cabinet are nested it may not be practical to eliminate individual part identification labels or paperwork. This is especially true if different color edges are applied to nested parts. Gianni Cavassa, CMS: Another advantage is that each individual part in the nesting process is sized very accurately. At a panel saw, the stress that's released in cross cutting and ripping releases tension that sometimes causes the panels not to stay parallel and corners aren't always 90 degrees. That can affect edgebanding and drilling. Tom Galzin, GPM: It suits the trend for smaller, more varied lot sizes. Today, if my wife can't buy a piece of furniture in the color and size she wants, and take it home that day or soon afterwards, she'll go elsewhere. 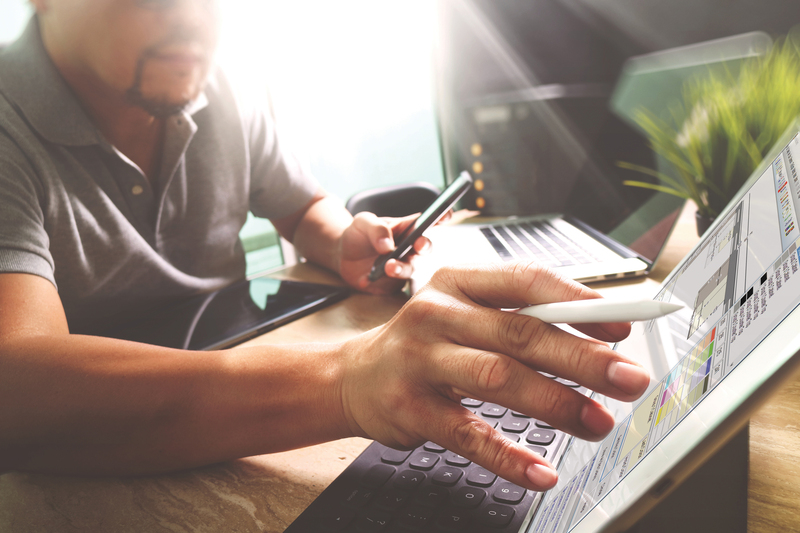 The delivery expectations of the market are driving the industry forward toward techniques like nesting. Downey: Because the CNC router handles all of the machining of the parts, you don't have to handle them multiple times. Plus, it requires less space than would a machining center and a beam saw. Susnjara: With a CNC router, analog adjustments don't exist; it's done automatically. So the first part that you turn out is good. That can improve material yield. FDM:How is the software used? Alsup: From a software perspective, we had to develop software that could keep up with the router - which could automatically create the drawings for every part in a job. The alternative was to hire more programmers, and that's not viable for most companies because they are expensive and hard to find. Herzog: In a nested-based system setting, programming as a stand-alone function is eliminated, as are any mistakes that can be made in a manual programming mode. A trained professional programmer isn't needed in a nesting system package. You would have a library of parts to choose from, and then give the machine a quantity of parts. It automatically creates the optimal nest for you. FDM:How does the productivity compare to a panel saw and point-to-point combination? Herzog: Although improved yield can normally more than justify the expenditure of a nested-based system, in my view, the real value is that the CNC router will guarantee the productivity you want every time. Worms: Productivity tends to be higher for two reasons. One is that a router allows high feed rates because it's a very rigid machine. Another is that you can amortize your tool change time. For example, let's say we can cut 10 parts out on a point-to-point. Each of those parts need three different machining operations - drilling, making a small groove, cutting it out of the sheet - that require three different tools. You would end up with 30 tool changes as each part was processed one at a time. On a router, you would take tool one and do all of your machining, then use tool two and finally, tool three. Basically you have done three tool changes for 10 parts versus 30. So the tool change time is spread out over all of the parts in each nest, rather than each individual part. Alsup: Generally, in a nested-based environment, a shop can run about 80 sheets in an eight-hour shift. And the parts come out right every time. Stephen: Although there is no need for a panel saw to cut the parts before they are placed on the machining center, in a cabinet shop it is difficult to imagine that a machining center could be used efficiently enough to totally eliminate the saw. But it could shift the requirement from a panel saw to a table saw, a savings of perhaps $40,000 to $60,000 for a small shop. I believe one must look at each application and logically conclude which approach or combination of traditional manufacturing and NBM is best for that particular application. Downey: Let's face it, there are faster ways to process parts than NBM. If speed is the main criteria, then a beam saw and point-to-point make better sense. It's just one more option for a manufacturer to determine what would work best for his business. FDM:Is nesting better for large or small batch production? Stephen: For the manufacture of some high-volume products the NBM concept may be best, especially when complex shapes are involved. In many cases it also makes sense to use a combination between NBM and more traditional methods, i.e. use a panel saw to cut blanks for nested odd shaped parts and produce rectangular parts the traditional way. Alsup: The key to whether a NBM would work for a company is to look at how it receives orders. If you're getting a lot of low-volume orders or do custom work where many parts are different, that's perfect for nesting because you're achieving zero setup, among other things. But if you're a company that makes 500 of the same unit at once, it wouldn't be that effective. In that case, stacking sheets on a panel saw would make more sense. Susnjara: With nested-based manufacturing, you can come to the point where switching from part to part almost instantly can have the greatest impact on your cost per part. When you can literally run any part without a setup, you might ask, "Why run a batch? Why not just make every part that you need for the piece of furniture right there?" Cavassa: Nesting is ideal for companies that produce around 250 units a day in a JIT manufacturing technique. If you need more than 1,500 parts a day, it's probably better to cut high stacks at a panel saw. Herzog: We would configure a machine for a nested-based scenario with very little setup, so it could accommodate short or production runs. The machine wouldn't care if each layout were different or not. Downey: Some larger companies are seeing the nested-based manufacturing as an opportunity to create a cell to handle special jobs that don't fit into their normal mass production. Smaller businesses are very excited about it. They want to keep their investment down, the number of employees down and don't want to use up a lot of space. FDM:Critics of nested based manufacturing point out that you can't do horizontal boring on a CNC router. How do you respond? Worms: Horizontal boring isn't really necessary unless you do dowel construction, which is not the majority of the people. Most people use a dado-rabbetting-type construction, and screw and glue their boxes together. You can do horizontal boring on a point-to-point, but some people don't do it on that machine because it takes too long. They use a separate machine. Cavassa: Because horizontal drilling is one of the slower operations and is normally coupled with dowel insertion, it should be done right before assembly and left out of the machining work cell. Alsup: Horizontal boring could be done as a secondary operation. Let's say we've got a five-minute cycle. The operator has five minutes while the machine runs automatically. He can take the last completed sheet and edgeband it or horizontal bore it or whatever. And that's free. Anything he does while the machine is running is free because you have already paid him for operating it. Downey: apps is offering an Omal CNC horizontal bore, glue and dowel inserter that reads bar code labels. These are applied to the parts as they leave the CNC router, and they are scanned at the nearby horizontal boring machine and processed. This allows you to address the parts as soon as they're ready, instead of accumulating like parts. The bar code can also include the necessary information for the edgebander. We want to integrate and automate the whole process. FDM:How do you handle the objections of reduced yield because of a router's larger kerf and the slower speed of a router? Worms: There are two concerns here that are routinely brought up. One is speed of machining. But in fact, because of a router's higher rigidity, we machine with higher feed rates than most point-to-points, despite the removal of more material. So that's not a problem. The other concern is yield reduction because you have a wider amount of material removal from a router kerf than a saw kerf. But that is offset by the way that parts can be nested in a jigsaw fashion on a router. Instead of optimizing parts through a crosscut first or rip first method to cut through the sheet, a router can cut in any direction and parts can simply be configured in the panel for the best yield. Herzog: It depends upon the material and layout. For example, right now we're able to cut a single panel of 3/4-inch material as fast as 2,000 ipm cutting rate. We can stack-cut the same 3/4 material, but the rate drops down to the 500 ipm range. There are guidelines as to which method makes more sense than the other. But the bottom line is that cutting rates have gotten much faster. For Accu-Router, that's because of improved technology, ultra-high-speed spindles - some at 30,000 rpm - and software that allows you to go around corners as fast as possible without loss of tolerance. Cavassa: CMS also has routers that can travel around 3,000 ipm, so speed is not a problem. You must make sure that you have a good nesting software package that will deliver the best yield. Susnjara: It's a whole series of tradeoffs. 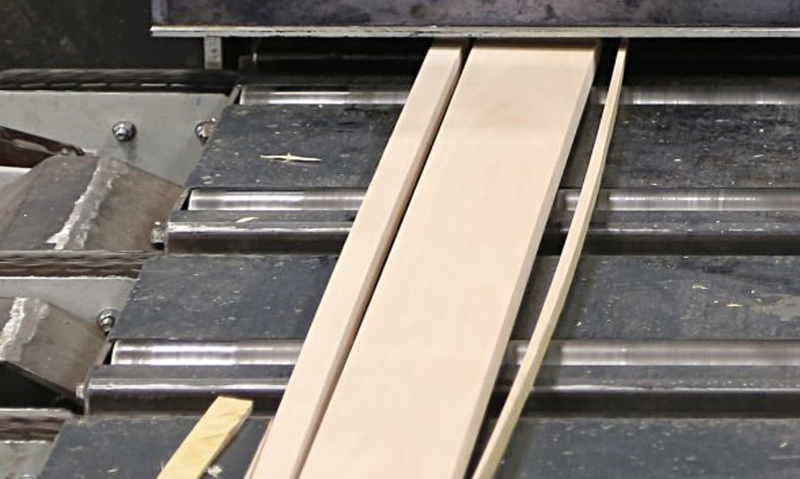 The kerf size of a panel saw may result in more yield than that of a CNC router, but the panel saw also requires more material handling and requires that the edges of the boards line up exactly each time. 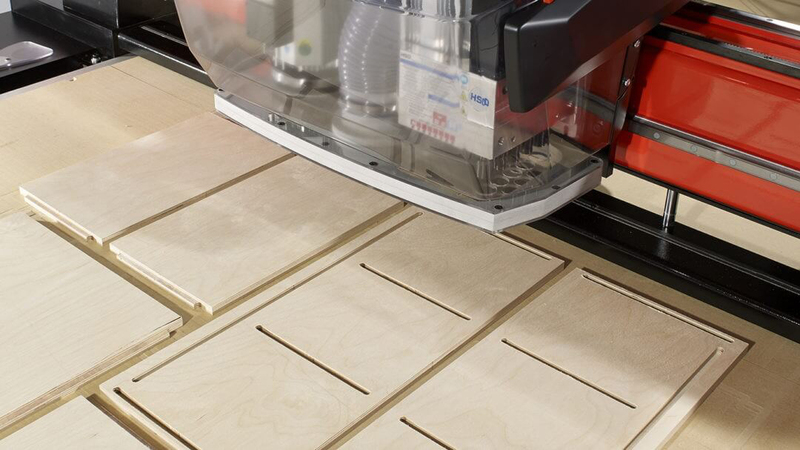 It's very simple to use a CNC router for nesting. Stephen: As the number of operations on the machining center increases, the time it takes to complete the operations increases. The machining center is typically the bottleneck in the process because it produces fewer parts per minute than other operations. This is true in traditional manufacturing as well as NBM, but the bottleneck is more severe in NBM because the machining center is doing more work. FDM:Besides a CNC machining center and nesting software, what's needed to create a nested workstation? Worms: One requirement is a larger vacuum pump to hold the parts down than what you would normally have on a point-to-point machine. We typically spec out a 25-horsepower pump, where on a point-to-point, the pump is usually in the 5- to 10-horse range. Galzin: The mathematical calculation we found for the necessary vacuum is 1 horsepower per square foot of table, minimum. With vacuum, more is always better in NBM. We're working with a company called Gridlock to offer a programmable pod table as an alternative to a low-density panel bleedboard. A 5 x 10 machine can have 250 suction cups that elevate slightly to allow the cutterheads to wrap around the bottom edge of the panel material for curved profiles, like a bull-nosed edge. If it's a straight edge, bleedboard will work well. In the not-too-distant future, program tables for bleedboards will be absolutely routine. FDM:What markets have embraced this type of processing? Worms: The number one market would be cabinet manufacturers, and store fixture producers would be number two. MDF door manufacturers are starting to come around because their lot sizes are coming down and this is making more sense to them. Also upholstered furniture manufacturers. Susnjara: There's no reason why you can't take the same software that makes kitchen cabinets, and design entertainment centers or bedroom furniture. FDM:Why is there so much interest in nesting right now? Susnjara: The U.S. woodworking industry is primarily operating on cheap labor. And with globalization, such an industry will move to where labor is the cheapest, which will likely be outside of the country. With NBM, we're trying to offer a technological direction for companies to take instead that will help them be internationally competitive. CNC specialist, Cabinet Vision Inc.
vice president of sales and marketing, CMS North America, Inc.
national sales manager, apps Div. of Holz-Her U.S. Inc.
vice president of technical service, Stiles Machinery, Inc.
senior applications engineer, Komo Machine, Inc.